PREPARATION: wash and cut zucchini into thin slices. Whisk the eggs in a bowl and add the cheese to it. COOKING: In a flat fry pan on medium heat add about half a teaspoon of butter to the pan. Once the butter is melted add the zucchini and let it cook for few minutes. Add the mushrooms and stir and let the two ingredients cook for few more minutes on medium heat. Evenly spread the whisked egg with the cheese (Yumm) on top the zucchini and mushroom. Once you have done that just add salt to taste. Let it cook for few minutes then gently with a flat spatula check the bottom of the omelette. If you can slide the spatula all the way through its time to flipy. Make sure that your spatula slides all the way through the bootom of the pan before you flip. Now all you have to do is just let the other side cook for few minutes and be patient because I know my mouth is watering with the entire nice beautiful aroma in the kitchen. Take off the stove and enjoy. I usually add more cheese before serving my Quissy because she is a very cheesy loving girl LOL. Enjoy! I look forward to the weekends .Weekends is my favourite time because I get to sit down and have a nice breakfast with my Quissy. Due to Quissy’s hectic work schedule it’s hard in the weekday to have a leisure breakfast. She is off to work before I am awake and I end up having eating breakfast alone for most of the week. Weekends are a way of treating ourselves with nice homemade omelette with different toppings. We both love fresh vegetables so we tend to make our omelettes with a variety of different vegetables during the weekend. 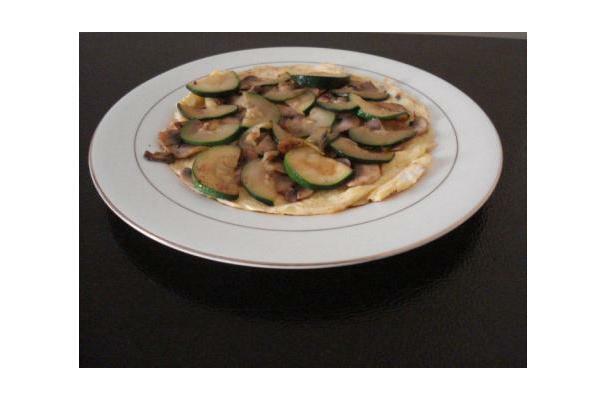 This weekend we chose zucchini and mushroom and egg omelette. We both love this breakfast and it’s a nice way to just sit and talk about our week during this delicious breakfast.